The sun was just an orange glow shining between the blinds. I knew it was still early in the morning because I couldn’t hear the tappa tappa of my dog’s nails on the hardwood floor. Beside me, in bed, she opened her eyes slowly as she rolled over to face me. “Good morning, beautiful.” I said. We talked for an hour, maybe more, getting to know one another. It was something that we had never made the time for. This was a side of her I had never imagined. Girl scout? Maybe. Guitarist in an all-girl rock band? Definitely. Altar girl? Never. “I had a very religious, catholic upbringing.” she explained. “Do you still believe in all of that?” I asked. I thought about it for a long time. No one had ever asked me that. “What do I believe in? I believe in motorcycles.” I answered. “Of course you do. What else do you believe in?” she asked. “Fuel injection.” I answered. She rolled her eyes at me. I wasn’t always like this. I may not have been up at the altar in my youth but I did wake up to go to mass with my grandmother for a number of years. At that time I believed in all of it. God. Jesus. Or at the very least some greater power. When my father was diagnosed with cancer I used to pray every day for him. I never prayed before that, and I never asked for anything selfish. My only prayer was for my father to overcome his cancer. Her voice on the other side of the bed was saying something to me, but I wasn’t there. I was standing at the altar, at my father’s funeral, reading the eulogy I wrote for him. “One day, me and you, we’re gonna have a little talk.” I said quietly to a painting of Jesus. The sound of her voice brought me back to reality. It took me out of that church and back to my bed. Back to the beautiful ex-angel by my side. “So where do motorcycles fit in?” she asked. “They turned my whole life around.” A long silence followed as my mind raced over all of the bikes, faces, stories, facts, and more. Who I was and who I had become flashed before my eyes. Motorcycles gave me confidence. They taught me to believe in myself and in my own abilities. For the first time ever I had something that I could really be proud of. Something that I had taught myself. Motorcycles took me to great places. 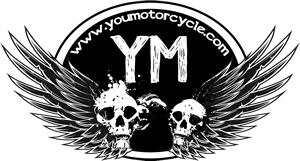 Motorcycles allowed me to meet a world of new people. Motorcycles have been good to me. You grow fastest when you’re willing to take a leap of faith, and get out of your comfort zone. Taking up motorcycling took me so far beyond being in my element. 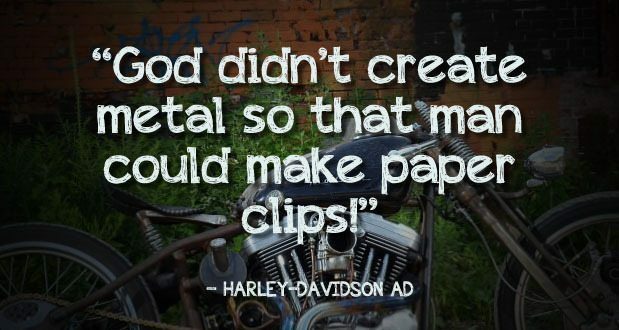 God didn’t create metal so that man could make paperclips. Maybe I owe some of the credit of my success to a higher power. I don’t know. For the moment, I believe in motorcycles. Wow! 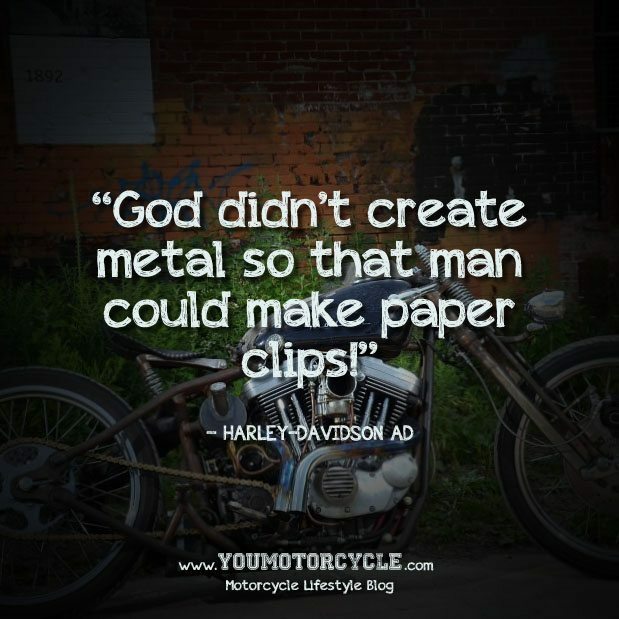 Can’t believe Harley doesn’t know the difference between a “paper clip”…..and a “paperclip”! Michael… Have you looked it up in the dictionary? It’s two words. Not even going to get into the rest of your comment… Sorry brother. Wow! I can’t believe you didn’t know Harley should be written as Harley-Davidson. You know what else? There is a saying that people who live in glass houses shouldn’t throw stones. Maybe you should look it up. Wow……touchy, touchy!! You tryin to say your Harley DOESN’T vibrate? No, I am not saying that and never suggested anything of the sort. I was just leaving a comment in the same style as you. Happy days!